Bushtec Safari is a renowned supplier of Africa’s most pristine and prestigious tented accommodation services. The brand, under the Canvas and Tent Group of companies, has built a reputation on designing, manufacturing and installing high-end, quality tents for the safari and luxury travel markets. Bushtec Safari is especially proud to announce the opening of the brand’s Magnum Opus, luxury eco-resort Kingfisher Lodge in the United Arab Emirates. 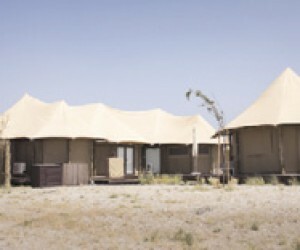 The tented lodge was commissioned by the Sharjah Investment and Development Authority (Shurooq) and constructed exclusively by Bushtec Safari’s team of multi-disciplinary experts. Situated on a strip of conservation land off the coast of the Oman Gulf, Kingfisher Lodge is surrounded by a forest of mangrove trees and precious shrubbery. Because of this, it was of great importance that the building process be environmentally responsible, and the positioning of the eco-lodge be stringently respectful of the natural resources in the area. The Bushtec Safari team carried out this most important task with great care and diligence. The company’s experienced team of accommodation specialists works closely with clients throughout the planning and construction phase, paying close attention to retaining client buy-in. Since the company offers turnkey solutions, it is their highest priority to provide a one-stop-shop for all client needs, from the foundational requirements of installation to the minor details such as interior decor. This project was conducted on a scale far greater than any project preceding this, and took a full year to complete. Being that Bushtec Safari prides itself on its turnkey capabilities, which translates to providing cradle-to-grave solutions, this particular endeavour ventured well beyond merely building the lodge. The foundations of the development began at tent designing and camp planning, conducted by a highly practiced team of architects, designers and building specialists. The safari tents were then manufactured at the state-of-the-art Canvas and Tent factory in Ladysmith, Kwa-Zulu Natal. Here, all products underwent rigorous quality assurance checks before being dispensed to the shores of the UAE. After numerous site visits, a large team of workers was sent to install the lodge. Installation involved not only the building of the fundamental structures, but also full electrical and water reticulation. Soon after this, a meticulous process of interior decorating commenced, carried out by leading figures in the field, until a stunning picture of luxury accommodation excellence was created. When construction was completed in early 2018, Kingfisher lodge already boasted an opulent array of structures. Among these are 20 luxury accommodation units, five of which are family units and 15 of which will accommodate couples and single guests. These tented chalets include bedrooms, bathrooms, living areas and patios, as well as their own private swimming pools. Adding to the extravagant ambience of the resort is a compliment of facilities to ensure every guest’s stay is optimally comfortable. These include restaurants, outdoor recreation centres, conference facilities, prayer rooms, and two spas for males and females respectively. The aim is to provide a nature getaway destination with all the spoils of daily, city life. As part of our commitment to delivering products of utmost quality, Bushtec Safari complies with various international standards and quality control bodies. One of these is ISO 9001:2008, for which the company has been repeatedly reviewed over the years, and found to be excelling in service delivery. Contact Bushtec Safari today for full turnkey, luxury accommodation services, encompassing tent design, tent manufacturing, camp planning, full installation, water and electrical reticulation, and interior decorating.